The golden rule of less is more is not adhered to as often as you might think. Many businesses can get excited seeing their website being developed, their branding coming together, or even get overwhelmed with enthusiasm in brainstorming meetings. All of that passion and excitement is fantastic, yet it can cloud judgement and interfere with decisions rather quickly. It’s spoken about in design quite often, but it should also be applied to everyday business, if not every day life: the KISS rule. 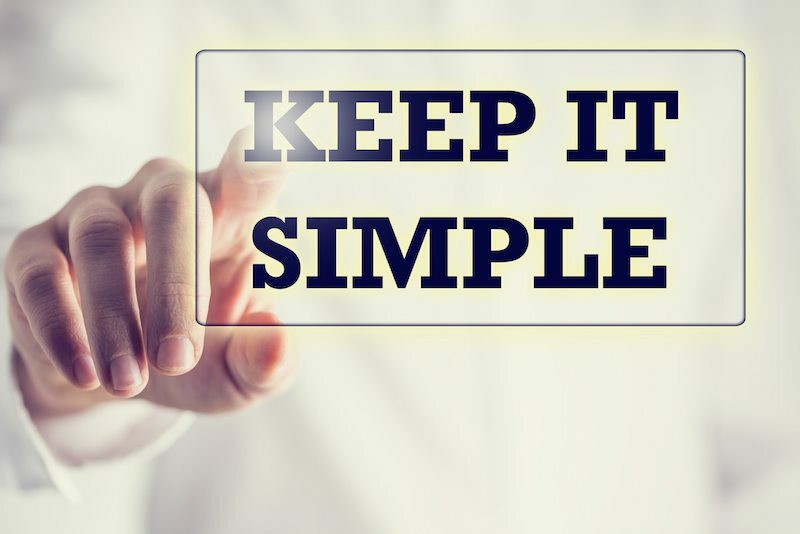 “Keep It Short and Simple” are words to live by in order to keep all brand imagery clean, sophisticated, neat, tidy and legible. The more colours, fonts, images, text, link, and anything else you can jam in to a branding package or web layout, the more confusing it can be to decipher who the business is, what they do, and what they stand for. In the spirit of keeping things simple, here’s a handy little list of tips and tricks when it comes to branding and content creation. When creating imagery, branding details, content or even documentation, three is the golden number when it comes to colours. Content should usually stay on brand (same colours as your logo etc. ), however black and white with a feature colour such as Chilli’s red or green will suffice. Because an element of the branding colour is still coming through, brand association to the reader can still be made. Keep it simple. There is no need for zigzag lines, triangles, a mass of colour and a small white box to be featured on the one image/document. Lay out your designs thoughtfully, carefully, making sure there is a document flow. Reading should be easy to comprehend and follow. Keep it simple. Whilst floral patterns are pretty, businesses generally don’t need wild patterns like this (unless you are an interior designer or florist). Block colours with the use of white space connote a higher level of professionalism and class, than elegant patterns. Keep it simple. Be succinct and clear with what you are trying to say. Just say it straight and blunt, then refine slightly to make the comments less harsh. Added ‘fluff’ only confuses readers, it doesn’t educate. Want to learn how Chilli can assist you with the KISS concept? (No we’re not puckering up!) Give us a call today or check out our Creative Page here to learn more.